Multiple wildfires in northern and southern California have led to tragedy and devastation in November 2018, with an estimated 66 fatalities (as of November 16) and more than 10,000 lost structures. Multiple wildfires in northern and southern California have led to tragedy and devastation in November 2018, with an estimated 66 fatalities (as of November 16) and more than 10,000 lost structures. The fires also sent smoke plumes hundreds of miles away, degrading air quality throughout the state. It’s the second year in a row that the state has experienced massive, destructive wildfires. Unlike locations East of the Mississippi, California’s precipitation is sharply seasonal, with hot, dry summers and wetter winters. A dry start to the current water year in October came on the heels of an even drier-than-average summer. The resulting dried grasses and vegetation provided plenty of fuel for wildfires to grow exponentially should a fire be lit. And in November, 2018, those wildfire powder kegs exploded in both northern and southern California. 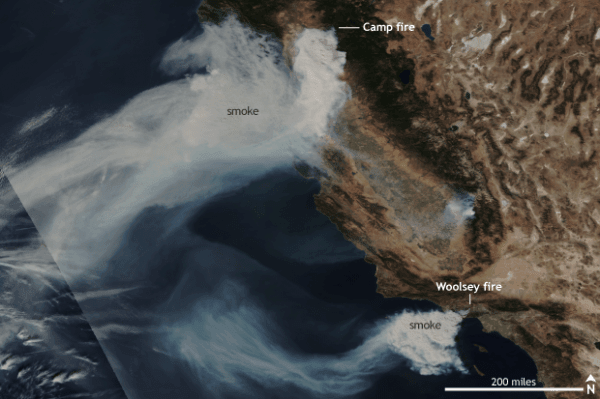 North of Sacramento, the Camp Fire burned an area of over 70,000 acres in less than a day starting on November 8, taking advantage of incredibly dry atmospheric and ground conditions while strong winds whipped the fire into a frenzy. As of November 14, the fire had burned over 138,000 acres of mostly non-forested land and was only 35% contained. The Camp Springs fire now has the dubious record of being both the most destructive and deadliest wildfire in modern history for California. In southern California, similarly hot, dry and windy conditions helped turn a fire into a raging conflagration in the hills north of Los Angeles. The Woolsey fire also started on November 8 and has burned almost 100,000 acres of mostly grass and shrubs and was 52% contained. The fire has impacted well-known communities north of Los Angeles including Malibu, Calabasas, Agoura Hills, and Thousand Oaks and has burned down over 500 structures as of November 14.